Today only at Woot.com this Eureka AirSpeed Upright Vacuum is just $69.99 (Reg. $111.29)! Deep clean carpet, bare floors and more with the AirSpeed Unlimited Pet from Eureka. 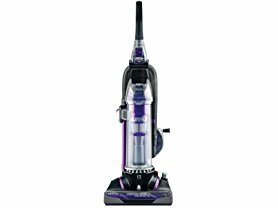 Engineered with an efficient air path with limited bends and turns allowing more air to pass through, this upright pet vacuum can even deep clean stairs and upholstered furniture with its 10-foot stretch hose and on-board tools. Its odor absorbing high efficiency allergen filter reduces dust and allergens and the washable, reusable dust cup filter means less frequent replacement while its multi-cyclonic dust cup system never loses suction and maintains power as you vacuum your home.